We’re really excited that this week we have sent our first shipment of books to Tanzania. 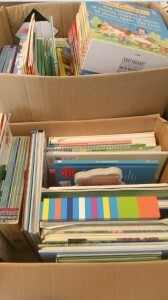 That’s 250 children’s books on their way to schools with empty libraries and hundreds of pupils will soon be reading them. We want to be sending these regularly. Whilst this will provide two schools with enough books in the short term, there are thousands of schools in developing countries in similar need which basically means we need more books! That’s why we want to re-double our efforts in sourcing children’s books. At the moment we’re relying on donations from people in Greater Manchester and we have a number of donation points in Manchester and Bury. If you have any old books going unused, please contact us or visit a donation point (you can find a full list here). We’re also hoping to recruit more volunteers to arrange local book drives. We can provide you with flyers and any other materials needed such as boxes to collect books in. If you would like to take part in our project, please contact us at [email protected] or tweet us – @NoBarriersFdn. We’re really pleased to have sent the first shipment this week but we want this to be a regular event. Please get in touch if you would like to help us or if you know someone who would. And finally, thank you so much to everyone who has donated so far! These books will make a huge difference in these pupils’ education and we rely on your support for that!